Feeling a bit 70's today, which puts me (according to the fashion press, anyway) on trend. I'm not usually big on following every trend as it comes out, and this was purely accidental- the jeans I always leave at home, a shirt I'm not planning to take back to uni with me and just needing my hair out of my face. But I like it. 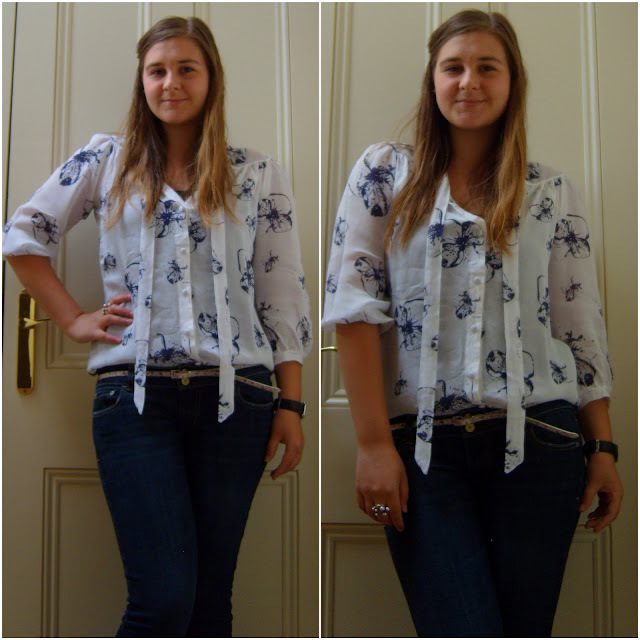 This shirt remains a firm favourite, and what you can't see is that the jeans are almost (but not quite) flares. I thought I'd better get some shots of this, because I'm actually planning on leaving the house again today and have put make-up on (and everything!!). I did end up watching bits of the Royal Wedding this morning. As Amy from Wolfwhistle said- I'm not really into it, but a bit like the world cup, I'm happy to go along with it. The dress was beautiful, the atmosphere in London seems to be lovely and it's nice to see something good happening. Like my 70's look? Watch the Wedding? Think it was one big celebration or just another day? P.S. Like the new name and design? Would love to know what you think of it. I do love a bit of 70's style - there's something so carefree about it. I have some flared jeans that were a random bargainous purchase but haven't worked up the nerve to wear them yet! that's a great pattern on your shirt! I really like this look, it's crisp, clean and oh so chic. love this blouse...cannot believe it is from tesco! !